Fireflies and Jellybeans: Don't Forget! Tomorrow is our Show Off Your Stuff Linky party! Get ready to link up your post, look at other's fabulous posts, and have a grand ole time! 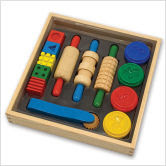 Also ,tomorrow is the last day to enter our giveaway for this great Melissa and Doug Clay Set. AND... Tomorrow is the last day to enter in the raffle at Life According to Leah. The raffle is to earn money for their adoption. You could win a really cute lunch set! WOW! Tomorrow is a big day!